Like celebrity reality TV shows, concept cars are a tantalizing glimpse into a life we can approximate, but never fully enjoy ourselves. 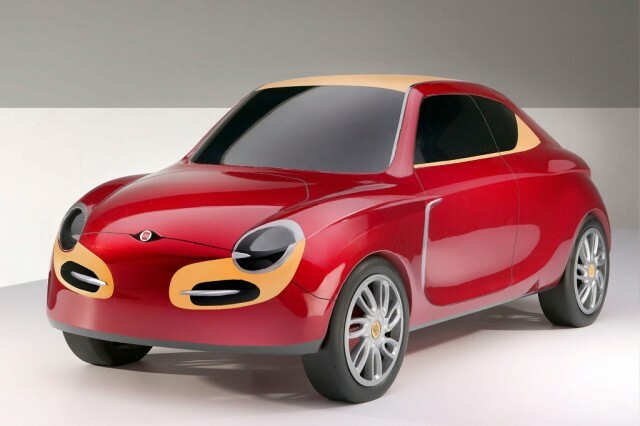 Take this Fiat Lussino concept, for example. "Lussino" is derived from the Italian word lusso, or "luxury". "Ino" makes it "small luxury". It's the work of LA-based industrial designer Joseph Martinez, and the compact sedan isn't a million miles away from the sort of product Fiat could sell alongside its 500 city car. Joseph's design renderings show the car compared to various vehicles--it's larger than a Fiat 500, around the same length as the MINI Clubman wagon, and a bumper's length shorter than a Toyota Prius. Like the 500, the styling has significant retrospective touches (though the asymmetrical door layout is more modern), but the drivetrain layout is even more retro than the 500, with a rear-mounted engine and rear wheel drive. Confusingly, it's listed as a "900cc T 1.4 liter 130 hp 2 cylinder". 900cc and 1.4 liters contradict each other, but a 900cc 2-cylinder sounds very much like Fiat's existing TwinAir engine to us, so we'll run with that. It's supplemented by front- and rear-mounted electric motors driving each axle, and powered by a lithium-ion battery pack mounted under the rear seats. In another retro touch, the car's luggage space--and spare tire--is located at the front. The battery can be charged from an external source, making it a plug-in hybrid. The upshot of all that is 100 mpg economy with a reasonable turn of pace. Well, it would be, but Joseph's design, and its $26,000 price tag, is entirely virtual. His renders are beautiful, though, showing virtual screens from a Fiat website and a feature in car design and fashion magazine Intersection. They show the car being charged outside a chic cafe, and expensive luggage loaded into the front compartment. None of which is real, to us at least, like those star-studded celebrities' lives. You can check out Martinez's renderings in full on the Coroflot website.